In the Kabbalah and the Hebrew alphabet, Beth is said to represent a house. This is because in antiquity, the Hebrews were nomads who wandered the plains of the Middle east and lived in three sided tents, internally divided between male and female people. Beth may also mean 'family'. The tree of Life is the chief glyph of the holy Kabbalah. On the Tree of Life, Beth sits on the path between the source of all creation, Keter, and Binah, the 'female' force. Binah is that which constrains and shapes 'male' energy and thus gives shape and substance to the universe at all levels. Binah is sometimes known as 'the dark mother' and 'the bitter sea', as she is cognate with both absorption of the male force and with time. It is in Binah that space and time are created from the formless energy of Chockmah. We also see the power of Binah in the way it receives the male seed and generates new life from it. In our intertwined systems of the Tarot and the Kabbalah, the 'Atu' cards appear on the 22 paths between the Sephirah. 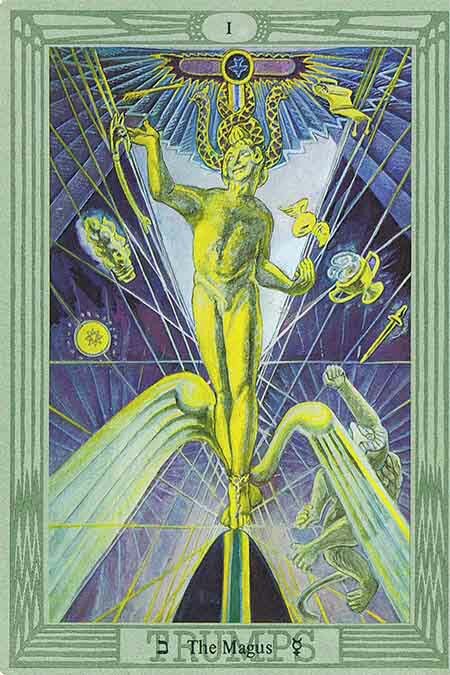 This is The Magus from the Thoth tarot deck by Aleister Crowley and Lady Frieda Harris (the artist). The first thing to notice in our discussion is that the letter Beth appears at the bottom left of the card, indicating its place on the Tree of Life (above). The androgynous figure represent the expressive force of the Magus (which in older packs was called the Juggler). He has the winged sandals of the god Mercury and atop his head we see a serpent wound into the shape of infinity. above this is a dove which represents the descent of spirit into the universe. We will now determine the meaning of the items around him. The Ape is the Ape of Thoth which falsifies his words. The meaning of this is that all expression of reality is distorted. As soon as we write or speak, we are conveying only a distorted vision of what is real. This is a critical lesson for the mystic and magician who studies the kabbalah as it teaches us that reality may only be comprehended by the silenced mind. Thus the second lesson of the yoga of the west is to silence the mind. the first lesson of course is to discipline the body into silence. The Winged Egg - this is the Kneph. In Ancient Egyptian religious art, Kneph refers to a motif, variously a winged egg, a globe surrounded by one or more serpents, or Amun in the form of a serpent called Kematef. It symbolizes the breath of life, and it was the breath of Knef that brought life to gods and man. In Crowley's Kabbalistic system, it represents the ascendant spirit, the "fire in the heart of matter".In Alchemy, the kneph represented the holy spirit, the state of volatility (mercury), or the creative force. Beth has the number 2 whereas its Tarot Atu the Magus has number 1 and the 12th path it sits on leads to the 3rd Sephirah, Binah. This symbolizes the first cause being extended through the projection of godly force and wisdom into the building of a universe or 'house'. But all words are an illusion and thus we live constrained not only by physical law and time, but by the illusions our minds spin from the words of god. This is the key to Beth and one of the keys of the Kabbalah. The video below is the property of the Ancient Hebrew Research Center. It's brief and quite fascinating. They have many educational resources for learning Hebrew and its history so please do visit them sometime - it's well worth it! (We are not affiliated in any way).